Our commiserations to Mr Alex Pollard of Shrewsbury, who has failed to prevent his local council from demolishing his wife in order to build a new flyover. Mr Pollard first became aware of the council's intentions three years ago, and began a lengthy legal battle to prevent the demolition order being carried out. He has, during that time, persuaded the council to consider a number of alternative routes, the most feasible of which would have involved flattening Mrs Hewson at number forty-two, or blasting a tunnel through the woman who works at the launderette. However, both these women have been declared areas of natural beauty and are therefore considered off-limits for development. As a last-ditch attempt to save his wife, Mr Pollard has claimed that she is a site of historical significance, but in a recent hearing he failed to convince the board of English Heritage that she was the scene of one of the most significant battles of the Civil War. 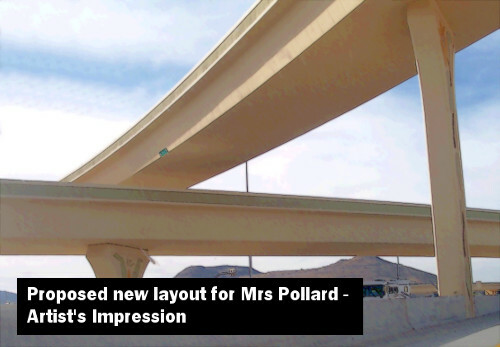 Work on the long-delayed flyover is now set to recommence and Mrs Pollard is scheduled to be blown up next Wednesday. Mr Pollard is, understandably, most distressed by this news and believes there is more to this decision than meets the eye. Ten years ago, whilst swimming in the sea during a holiday in Bournemouth, his mother was identified as a danger to shipping and scuttled by the Royal Navy. Mr Pollard believes, perhaps not unreasonably, that he is the victim of a plot and has warned other members of his family to be especially vigilant.